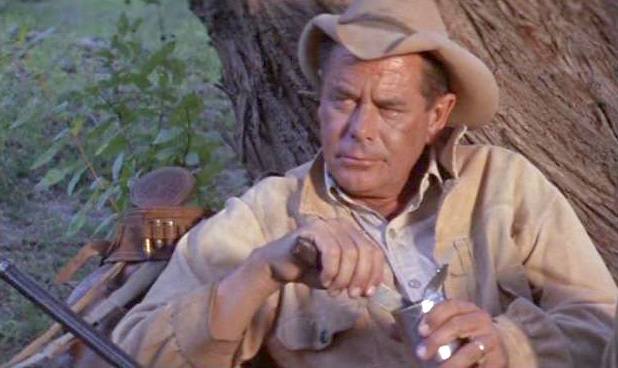 Day of the Evil Gun has a tried and true western premise: the family of a man (Glenn Ford) has been abducted by Apache Indians and he sets out to find them. Complicating his quest is his determination to give up his violent past, and the accompaniment of another man (Arthur Kennedy) who is in love with Ford’s wife. Their uneasy partnership leads to tension with each other, as well as with the dangers they find along the way. 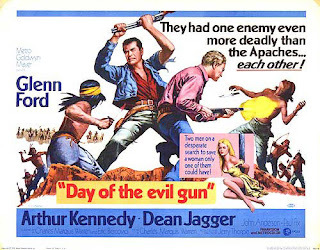 This movie made me think it a 1960s version of The Searchers, dirtier, more cynical, slower and with much less to say. Ford and Kennedy were excellent actors, and are capable in this. But we learn little about them. 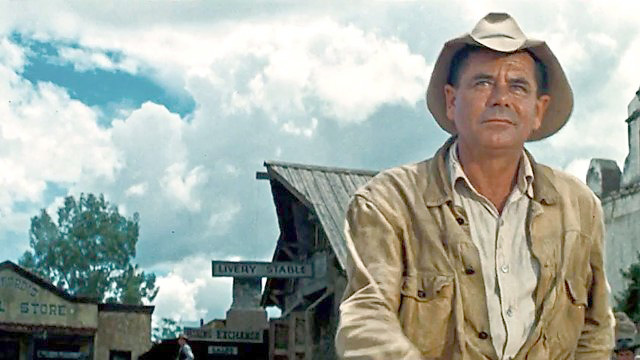 Ford was a successful gun-fighter who now eschews gunplay. He has been away for a long time, and thought dead by his wife. We can guess that he left his home to ‘find himself’, in a manner of speaking, to shed his past persona, but we are not told for certain, nor do we know where he went or why he chose to abandon his family. Kennedy’s character seems only bitter and resentful. All other people we encounter are no more than sketched in, though John Anderson, as a soldier with his own agenda, has a good role to play. A very young Harry Dean Stanton (credited without the ‘Harry’) and an even younger Barbara Babcock have small roles. There is action, and some good tension, though the the climax isn’t that climactic. The finale is, I think, meant to be ironic, but loses much due to the introduction of a key character in only the last few minutes. If he had appeared at the beginning as well, to provide ‘bookends’ to the story, what he says and does would have been more fitting, and the title would have had more significance. The direction is mediocre, with a number of techniques that I have found common in 1960s movies, such as the slow zoom. The film reminded me of television films of the 1970s. To be fair, this was the era when tv was becoming more sophisticated in its technology and methods, so it was ‘catching up’ to the cinema in many ways, and a number of tv movies of that period were very good. But in its production values, story, direction and scope, Day of the Evil Gun was probably wasted on the big screen. While much of the film was perfectly watchable, its worst aspect was the fact that neither of the main characters is likeable; neither gained the viewer’s sympathy. I didn’t care what happened to either of them, though I was interested enough in how they would solve their problems to see the movie to the end. But, in truth, the end of Day of the Evil Gun wasn’t worth waiting for. Those paint-balls can hurt, if they hit you in the right (wrong) place! What I like about painted posters is that the people portrayed rarely look like the actors. Glenn Ford looks more like Jethro from "The Beverly Hillbillies". To give the movie its due, that's a pretty good title!